When Jesus comes, healing miracles happen. If we read Matthew 9:18-30, we find Jesus in the midst of three miraculous healings. While he spake these things unto them, behold, there came a certain ruler, and worshiped him, saying, My daughter is even now dead: but come and lay thy hand upon her, and she shall live (Matthew 9:18). Jesus and His disciples followed Jairus came to his house (Matthew 9:19, 23). 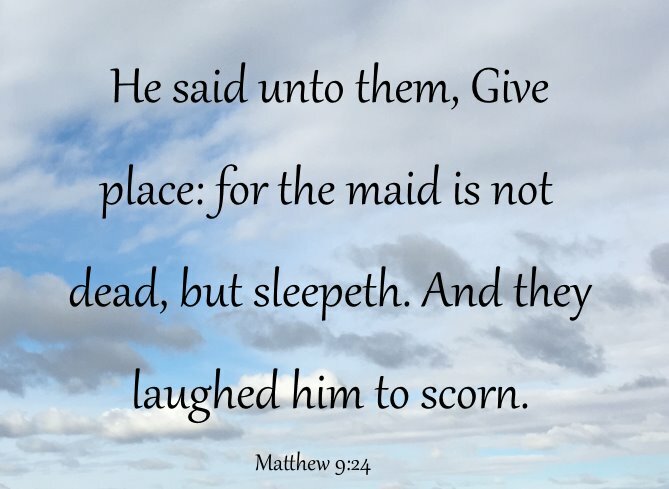 After Jesus saw Jairus' daughter, He told Jairus and the other people who had gathered there, that she was not dead but only asleep (Matthew 9:24). As they left the room where she lay, they laughed at Jesus. Jesus then took her hand and she arose from the bed (Matthew 9:25). We have faith that Jesus heals. When others mock Jesus' ability to heal, we continue to believe that He is the healing God. On the way to Jairus' home another one of Jesus' twenty-seven healing miracles occurred (Matthew 9:20-22). A woman, which had a disease for twelve years, came behind Jesus, and touched the hem of his garment (Matthew 9:20). 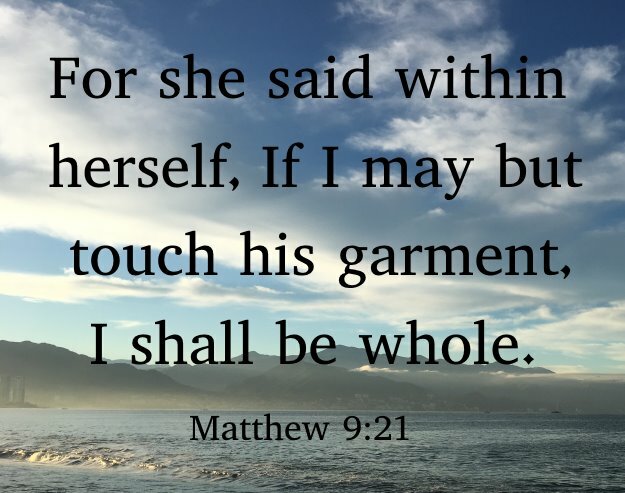 She had said to herself, "if I touch His garment I will be made whole" (Matthew 9:21). After she touched Jesus' hem, He turned to her and told her that her faith had made her whole, and from that day forward she was healed (Matthew 9:22). When Jesus is near we need to seek Him out. This might occur in prayer (Isaiah 38:2-4), in worship (Mark 1:40) or at a church service (Acts 20:9-12). We need to have faith to say within, "if I just touch His spiritual hem, I will be made whole". Any unbelief will prevent miracles from happening (Mark 6:4-6). 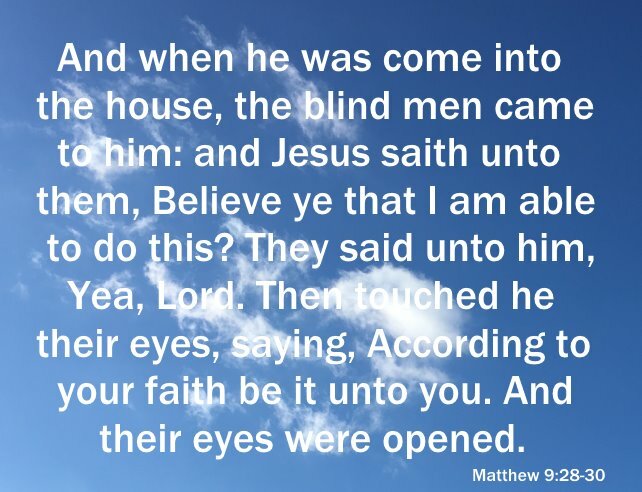 And when he was come into the house, the blind men came to him: and Jesus saith unto them, Believe ye that I am able to do this? They said unto him, Yea, Lord. Then touched he their eyes, saying, According to your faith be it unto you. And their eyes were opened (Matthew 9:28-30). This healing miracle adds additional insight to what we have already learned. There will be times when we need to cry out to God to get His attention. Even Moses cried out to God to heal his sister (Numbers 12:13). Having said that though, we can cry out until we are blue in the face if we do not believe that Jesus is able to heal us. Also we should notice from this passage of scripture that believing and faith are sometimes synonymous. For a more detailed discussion on the similarities of faith and belief click here. Seek Jesus out including the possibility of crying out for His mercy. Believe and have faith that Jesus heals, no matter who may mock our conviction that He is the great Rapha, the healing God.